UDM Downloads > Direct MIDI to MP3 Converter! Direct MIDI to MP3 Converter is a fast audio utility that allows you to convert MIDI files to MP3, WAV, WMA and OGG formats. Our audio converter can quick render the MIDI file into an audio format that you can burn on an audio CD and play on a regular CD player. An essential difference between Direct MIDI to MP3 Converter and other similar programs is that our MID Converter provides direct MIDI conversion (rendering) without sound recording. The main advantages of direct MIDI conversion are the CD audio quality, the conversion speed and the silence during conversion. You don't need to listen to the MIDI music and adjust recording level while converting. Just drag and drop your MIDI files and the rest are done automatically by Direct MIDI to MP3 Converter. Conversion speed is up to 10 times faster then original midi file time! Musicians can use own SF2 soundfonts for rendering and change the instruments quality. A built-in audio player (with trackbar) helps you pre-listen to MIDI, MID, RMI or Karaoke files before converting. And the built-in easy-to-use OGG/WMA/MP3 Tag Editor helps you name your MP3, WMA or OGG tracks. The batch mode helps you simultaneously convert multiple MIDI tracks to MP3. The batch MIDI to WAVE conversion is very useful for creating musical collections on an audio CD. The resulting WAV or MP3 files can then be burned to an audio CD using any CD recording program. Or you can download it to your Apple iPod or other portable MP3 player. Using the Tempo change feature, you can create an album of your favorite MIDI or Karaoke MIDI compositions performed in any tempo. Quality options are adjustable. You can convert your favorite mobile phone MIDI ringtones to MP3 with adjustable reverberation. 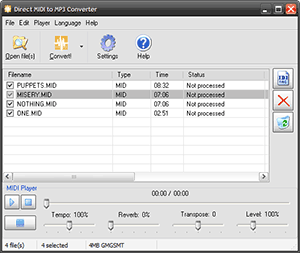 Direct MIDI to MP3 Converter is a great choice for MIDI artists, and amateur or professional musicians who compose MIDI music using digital pianos, keyboards or music sequencers and need a tool to convert MIDI (MID, RMI, KAR) files to popular audio formats.